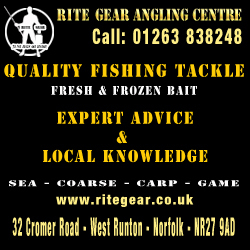 18 anglers turned up for tonight’s Bacton match, a venue we have fished several times over the years, based at Redhouse Caravan park we always fish to the right of the revetments, to everyone’s surprise the beach had changed dramatically, with water filled gulleys close in spreading out to the end of the groins to the sand bar, waders were the order of the day but for some fishing the gulley close in would have to be the option, none of us have ever seen the beach quiet like it is now. Expectations were not high and with a carpet of weed close in we all feared the worst. For some the weed was a major problem, but if you could manage to get close to the waters edge and fish from the sand bank with rod up high the weed further out was minimal, but so were the fish. Flounders would probably be the target species if you could find them, not everyone made it to the end of the match due to conditions of weed and gulleys, so from the 18 starting only 7 managed to find a fish or two. Top spot this week went to Dene Conway with two fish for 1lb 4 2/3oz, including a smooth hound pup at 37cm. Second place podium went to guest angler Mark Kizzy, with two flounders for 10 2/3oz, and final podium spot went to Russell Taylor with three fish for 10 1/3oz. All in all a very tough evening and a steep learning curve for some. Welcome to new members Nathan Boughen and Chippy Mortimer hope we will be seeing more of you at future matches. Next weeks match is at Salthouse so back on the shingle again, please book in early especially with bait orders.